Who needs love when you can eat cheese? Heartbroken and on the cusp of turning 30, Ella decides to pack her bags and move to Paris, somewhere she had visited when she was a different, more adventurous person. It’s on the streets of beautiful, romantic City of Light that she finds her heart’s true desire: cheese. For Ella, her local fromagerie becomes a safe haven and she finds herself being drawn back there day after day. But in a strange city, being friendless and not able to speak the language, has she bitten off more than she can chew? Ella has just been dumped by her long-term boyfriend, okay actually she did the dumping but he gave her no choice. You see her now ex, Paul, decided that because he was successful at his job and earning a lot of money that he needed to go off for a while and ‘find himself’. He told Ella only a few hours before he jetted off to some hidden retreat, he also told her that he thought they were just having fun – yep, after over 8 years together (and living together) he has decided that they were not even in a serious relationship – you see why he left her with no choice? After breaking the news to her mum that she had broken up with Paul and getting an ear-bashing (her mum loved Paul), she decided on the spur of the moment to take a year out and move from her home in Australia to go and live and work in France. However, being on the opposite side of the world from her friends and family is exciting, but daunting too. She doesn’t know anyone, and can barely speak the language. Her only solace is the divine cheese shop where the owner has been ever so friendly to her. 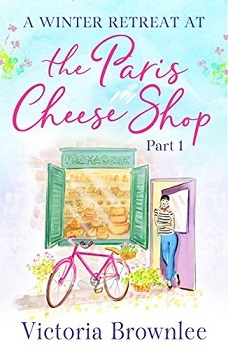 A Winter Retreat at the Paris Cheese Shop is the first book in a four-part series by Victoria Brownlee and set in gorgeous Paris, France. The book is very short at only 69 pages and took me under an hour to read. Ella is a lovely young woman who may have just saved herself more years of being in a one-sided relationship. The idea to move to France just came to her, out-of-the-blue, but she decided to go back to being that carefree woman she used to be. I can fully understand her reasoning why. It takes some bravery to make a decision like that and stick to it though. Whilst the book is named after a cheese shop, it doesn’t really play a major part in this first story, but I’m sure it will in the other books that are in the series. I fully enjoyed the read. The descriptiveness was just enough to put me in the heart of Paris, without taking over the book, with it being so short. I can’t wait to see how Ella spends her year in France by getting my hands on the other three books when they are released. Victoria Brownlee is a food writer and editor, currently based in Paris. She started writing about food over eight years ago, first as a blogger, and then as the Food & Drink Editor at ‘Time Out Shanghai’. She has an MA (Publishing and Communications) from the University of Melbourne, Australia, and continues to write freelance articles on food trends across Europe. ‘Escape to the Paris Cheese Shop’ is her first novel, published in four parts from May 2018. This looks like fun – I wants it! Great thorough review. I don’t think this is something that I would read. Cute cover. Great review! This book looks like a fun rea!